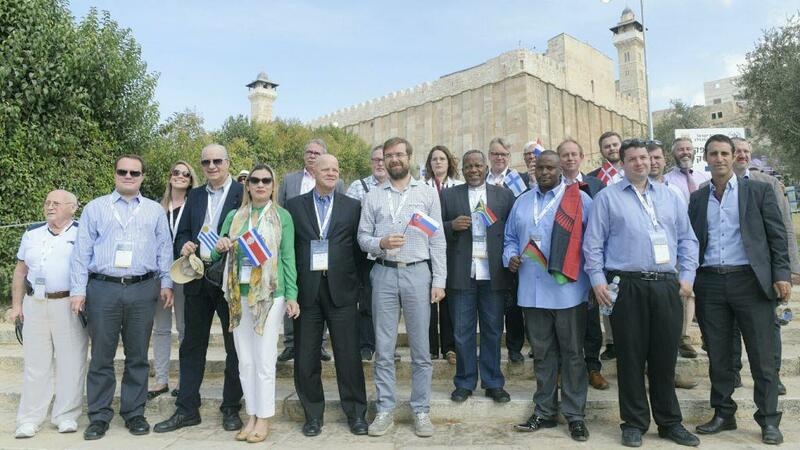 20 elected officials from around the world visited Hebron for the event. 20 global parliamentarians joined over 30,000 people who came to pay homage and celebrate at the annual Succot festival in Hebron. This proud display of solidarity comes a day after UNESCO passed a resolution denying the Jewish connection to the Temple Mount and audaciously demanded that Israel remove the Tombs of the Forefathers and Mothers (Cave of Machpela) in Hebron off of its heritage sites list. The Jewish Community of Hebron sees the annual mass pilgrimage to Hebron as the perfect answer to the UNESCO vote, and a strong kickoff to the 50 year anniversary celebrations for the liberation of Judea and Samaria. For 19 years, Jews were unable to access the holy sites in Jerusalem and Hebron until the 1967 Six Day War. The Israel Allies Foundation brought Members of Parliament from around the world as part of their annual Israel Allies Chairman Conference. These included Member of the European Parliament Bas Belder, MEP Branislav Škripek, MP Jeppe Jakobsen of Denmark, MP Antero Laukkanen of Finland, MP Inga Bite of Latvia, MP Kees van der Staaij of the Netherlands, MP Peter Östman of Finland, MP Pablo Casado of Spain, MP Marek Krajčí of Slovakia, MP Alfred Heer of Switzerland, Minister Ruperto Long of Uruguay, Congressman Gerardo Amarilla of Uruguay, Congresswoman Karla Prendas of Costa Rica, MP Kenneth Meshoe of South Africa, and MP Malani Mtonga of Malawi. The Council of Judea and Samaria (Yesha) organized their tour to the Hebron Jewish community, and the MPs got to meet with leaders of the Hebron Jewish community, Director General Uri Karzen, Spokesman Noam Arnon, and International Spokesman Yishai Fleisher, as well as Oded Ravivi, mayor of Efrat and the Yesha Council’s international envoy, and Shiloh Adler CEO of the Council. Simultaneously, the public festival, organized by the Hebron Jewish Community, included musical performances from top-name Israeli and Jewish artists, blessings from Israeli Members of Knesset and Ministers, as well as tours of historical sites and family-friendly activities. Among the highlights of the festival was the opening of the Isaac & Rebecca Hall for Jewish people - the hall which contains the cenotaphs [stone memorial markers] for the Biblical Isaac and Rebecca. This area of the Tomb of Machpela is accessible only ten days a year as part of a rotation agreement with the Muslim Waqf. The hall is the largest in the Tomb of Machpela, the ancient complex built by King Herod the Great as a memorial to the Jewish forefathers and mothers who are buried in the underground caves below the massive edifice. Also open to the crowds was the Cave of Otniel Ben Knaz, the first judge of Israel. As described in the Book of Judges and the Book of Joshua, Otniel was the brother of Caleb. Today his burial tomb is located in the H1 section of the city and generally off limits to Jews, as are three other Jewish historical sites. The cave corresponds to the description of ancient Jewish burial practices in the Mishna. Deputy Foreign Minister Tzipi Hotovely stated that despite UNESCO, the Ministry of Foreign Affairs campaign to celebrate 50 years of Jewish presence in Judea and Samaria "begins today in Hebron." Also speaking were Members of Knesset Moti Yogev, Ayoob Kara (who spoke about the connection of the Jewish and Druze communities), Nurit Koren, Oren Hazan, and Amir Ohana. The main event of the festival is the music concert featuring Jewish-American singer Mordechai Ben David. MBD, as he is affectionately called, has performed in Hebron numerous times and even written several songs about the city. Also performing was Benny Friedman, the United States-based singer known for his viral video Yesh Tikvah. Other singers included Haim Israel, who performs every year and is a star in the Mizrachi / Sephardic Jewish music world. Also on stage were Ami Cohen, SHUKY, Dov Karp, Akiva Margaliot and others. The Jerusalem Municipality arranged special bus transportation to and from the Tomb of Machpela for the event. The Jewish Community of Hebron also issued thanks the IDF personnel and police presence who secured the event thus enabling Israelis from all over the country to get in touch with their roots and enjoy the Succot holiday. For coverage of last year's Succot festival which featured headliner Lipa Schmeltzer, click here.